Women from the Cooperative and from the surrounding Colonias attend a weekly prayer group. The Center also offers Bible study classes, classes on spirituality/prayer and retreat days for women. The women consistently claim that the Spirituality Programs are the heart of the Center’s activities. Valores, Fe y Vida is a four-year program of personal growth and development for the women (all women at the Center and open to women living in the Colonia). The classes over spiritual growth as well as leadership development and values based decision making. At present twenty-three women, a highly committed group of women have formed a Cooperative which is called, Cooperative Las Mujeres de Esperanza y Fe. The original women who started the Center are part of this cooperative. The women make hand sewn products to sell in order to supplement their family income. 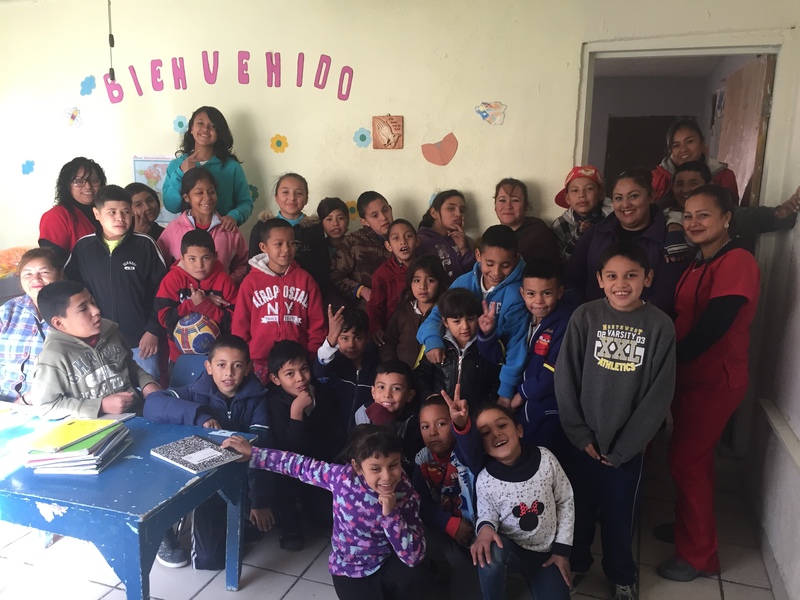 The Cooperative has evolved into the base community at Centro Santa Catalina. This cooperative initiated as a dream that has now become a reality. Our humble co-op is growing and trying to find new outlets for their products. At this time the co-op raises almost all the funds they need to exist with special help from St. Madeleine Sophie Parish located in Bellvue, WA. For a number of years, St. Madeleine Sohpie has listed Centro Santa Catalina at Christmas as one of the ministries needing help. Parishioners have donated gift cards from Jo Ann Fabrics, WalMart and Target stores. With these cards the co-op has been able to purchase sewing machines, scissors, irons and ironing boards, felt lining for some of the items, needles and other sewing needs. All fabric is purchased in Mexico. The co-op is on its way to being an independent business and they will remain with the Center as they grow. Women of the co-op and other women living in Panfilo Natera and other surrounding colonias participate in classes such as health education, parenting classes, citizenship classes, popular economic classes and nutrition classes. The classes are chosen from the articulated learning desires of the women involved at the Center. Children in the primary grades participate in a Homework Help -Tutoring Program three times a week for two to three hours a day. Four dedicated women (some paid staff) and three volunteers from El Paso, Texas, teach in the Homework Help Program. It is often said that education is the key to success; with your support the Homework Help Program (HHP) provides academic help to students unable to receive this help at home due to the lack of formal education for most of the parents. HHP’s success has inspired a local business to give a little of what they have; we recently received as a donation, 20 computers where we can now teach our students how to use them. It was a blessing to receive such a beautiful donation, for as we all know technology is now part of our lives. The children are being prepared to succeed in the future. With your support, we were able to purchase school supplies for all the students, i.e. printing paper, books, cartridges, internet connection, bookcases, chairs, tables, etc. Currently, one of the classrooms vacated by the pre-Kinder is being organized as our very own library – the Colonia’s first library. This program is held one day a week for two hours a day. It is taught by volunteers from El Paso, Texas. Presently there are two levels, beginners and advanced. Through a grant from the Raskkob Foundation a three-year Leadership Formation Program has been established (2000-2003). The goal of the program is to work with the paid members of the Center and four women participating in Center Programs (all women of the Colonia) in order to develop the leadership skills necessary for a sustainable future for the Center. The Center is able to begin again a garden program. When we returned to the Center all the garden equipment was missing. With your help, we have replaced most of the garden needs and the women are working toward creating a garden co-op where we will be able to provide vegetables for their families and eventually sell vegetables to families living in the Colonia. Through this program we all will promote education about good health and eating habits.